Arthur Francis was born in London, Middlesex, on 7th April 1855, the second eldest son of Elizabeth and Charles W. L. Francis, a hairdresser and photographer. Arthur's father, Charles William Lester Francis (born 1830, Faversham, Kent) was a hairdresser by trade, but by the early 1860s he was taking photographic portraits as a sideline to his business. On 29th April 1852, at Holy Trinity Church, Lambeth, Charles William Lester Francis, who had just turned 22, had married Elizabeth Rebecca Heslop (born 1828, St Martin's-in-the-Fields, Westminster, London), the twenty-three year old daughter of Martha and Peter Heslop. 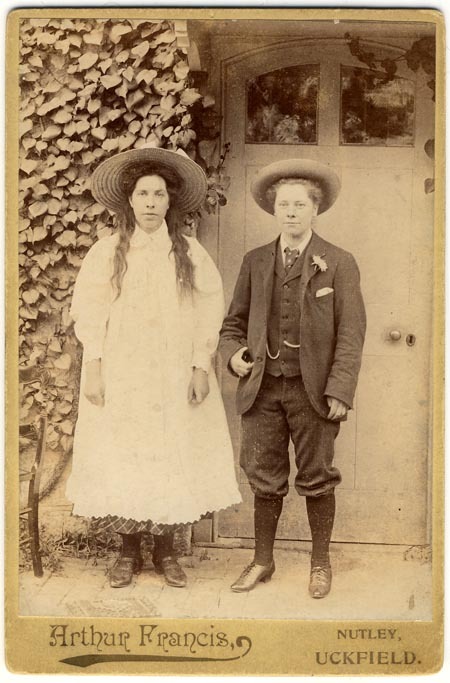 This union produced four children - Charles Edward William Francis (born 1852, Gravesend, Kent), Arthur Francis (born 1855, St George-in-the-East, London), Lester Francis (born 1863, Abergavenny, Monmouthshire) and Elizabeth Francis (born 1865, Abergavenny, Monmouthshire). Around 1860, Charles William Lester Francis, who at this time was described as a "Master Hairdresser", took his wife and children to Wales, establishing a hairdresser's shop at No.20 Frogmore Street, Abergavenny. By 1865, Charles W. L. Francis, was taking photographic portraits at his business premises in Frogmore Street. (Local trade directories list Charles William Lester Francis as a professional photographer at 20 Frogmore Street, Abergavenny between 1865 and 1871). Arthur's father, Charles W. L. Francis, died In Abergavenny in 1875 at the age of 45. Presumably, Charles Francis' widow and his son Arthur Francis continued to operate the photographic studio at 20 Frogmore Street. The 1880 edition of Slater's Directory of Monmouthshire still lists the Francis studio in Abergavenny under the heading of "Photographers". Slater's Royal National Commercial Directory of North & South Wales, published in 1880, records Arthur Francis as a "Photographer" at 20 Frogmore Street , Abergavenny. When the census of Abergavenny was taken on 3rd April 1881, Mrs Elizabeth Rebecca Francis was recorded at 20 Frogmore Street with her four children. No occupation is given for Mrs Elizabeth R. Francis, who is described by the census enumerator as a 49 year old widow, but her twenty-six year old son, Arthur Francis, is entered on the census return as a "Photographer", working from the family's home address in Frogmore Street. Almost a decade later, Arthur Francis was still operating the photographic studio in Abergavenny's Frogmore Street. The 1891 edition of Kelly's Directory of Monmouthshire lists Arthur Francis as a "Photographer" at 20 Frogmore Street, Abergavenny, but by the end of the year, Arthur Francis was living and working in the small Sussex village of Nutley. [ABOVE] Arthur Francis (1855-1934) photographed in the 1890s when he was working as a photographer in the small Sussex village of Nutley. [ABOVE] A cabinet portrait of two young women photographed by Arthur Francis of Nutley (c1895). [ABOVE] A photographic view of the village of Nutley, showing at centre-left the old Nutley Inn and Nutley Public Elementary School (c1905). 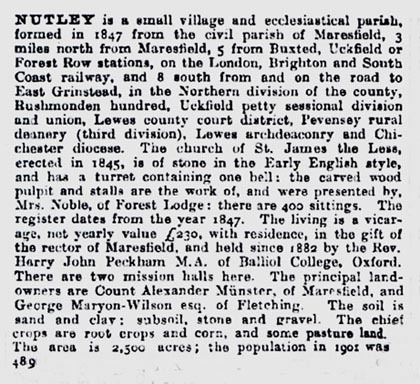 [ABOVE] The Sussex village of Nutley described in the 1905 edition of Kelly's Directory of Sussex. When Arthur Francis arrived in Nutley around 1890, the village had a total population of 990. [ABOVE] Arthur Francis listed as a professional photographer in the Sussex village of Nutley in the 1905 edition of Kelly's Directory of Sussex. 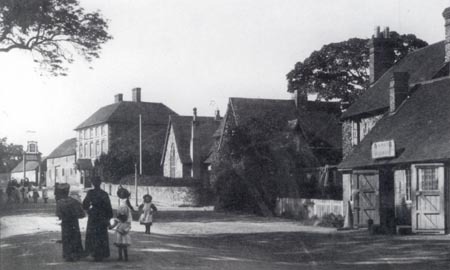 Arthur Francis must have arrived in Sussex before the middle of 1891, because he fathered a child in the village of Nutley during the First Quarter of 1892. The mother of the baby was Caroline Stevenson (born c1870, Horsted Keynes, Sussex). The birth of the child was registered in the district of Uckfield under the name of 'Harry Stevenson', although the boy was generally known as "Harry Francis" in the village of Nutley. A second child, known as "Albert Francis", was born in Nutley around 1894. There is no record of a formal marriage between Arthur Francis and Caroline Stevenson, yet the couple lived as man and wife and they were still together at the time of the 1911 census, when Arthur declared that he and his wife Caroline had been married for 21 years. Peter Kirby in his book "Forest Camera: A Portrait of Ashdown" comments that Caroline Stevenson, Arthur's common law wife, was "known as 'Tiny Bob', thought to derive from a mannerism". 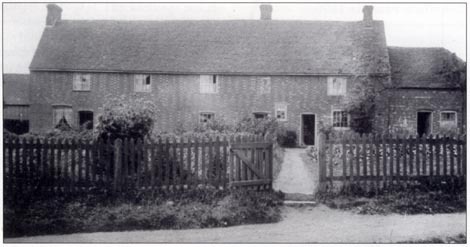 Arthur Francis lived in a house called 'The Shanty' at one end of the Barracks in Nutley High Street. As this 'house' appears to have had only one room and an outside closet, it would seem that Arthur had no photographic studio. For that reason, Arthur Francis took all of his photographs in natural daylight, going out and about to capture images of forest folk in their working dress, including their hats, boots and tools of their trade. Having taken a photograph, Arthur Francis would then run off several prints and hang them on his gate, hoping passing pedestrians would stop and buy one. [ABOVE] A photograph of The Barracks, High Street, Nutley (c1890), showing, on the right, the one-storey building known as "The Shanty", from where Arthur Francis worked as a photographer between 1890 and 1924. Peter Kirby, the author of "Forest Camera: A Portrait of Ashdown" wrote: "Arthur Francis lived in The Shanty, the single-storey end of The Barracks, and would hang any photographs he wanted to sell outside on the wooden fence". Arthur Francis worked as a photographer in Nutley for over 30 years. Presumably, Arthur Francis set himself up as a photographer in Nutley shortly after he settled in the village around 1891. Arthur Francis is still listed as a photographer in Nutley in the trades section of Kelly's Directory of Sussex published in 1924. Arthur Francis took many portraits of the inhabitants of Nutley, photographing his subjects on location in their usual setting. Among the many photographs taken by Arthur Francis are portraits of tenant farmers, agricultural labourers, tinkers and tramps. Many of the workers Francis photographed are posed holding the tools of their labour (scythes, turf cutters, spades, etc.). The 1901 census records Arthur Francis as a "Photographer" residing with Caroline, his common law wife and their two boys, Harry Francis (aged 9) and Albert Francis (aged 6). A decade later, when the 1911 census was taken, Arthur Francis is recorded at "The Barracks, Nutley", living alongside Caroline Francis, who is described as a forty-one year old "Laundress", and their two teenage sons, nineteen year old Harry Francis and sixteen year old Albert Francis. The older boy, Harry, was working as a "Farm Labourer", while his younger brother, Albert was employed as a "Gardener". Arthur Francis is recorded as a sixty year old "Photographer", yet he was only 56 years of age when the census was carried out. Peter Kirby in his book "Forest Camera: A Portrait of Ashdown" gives an account of the last two decades of Arthur Francis's life, when the old photographer was living alone and was employed as the village's lamplighter. Peter Kirby reports that Caroline went to live in the South London suburb of Penge with her married younger son, Alfred Francis (Stevenson), so that she could help him care for his children. Arthur Francis's grandchildren were occasionally brought to Nutley to see their grandfather. Peter Kirby remarks that one of Arthur's grand-daughters remembers him 'as a Father Christmas figure, and a bit of a gentleman'. 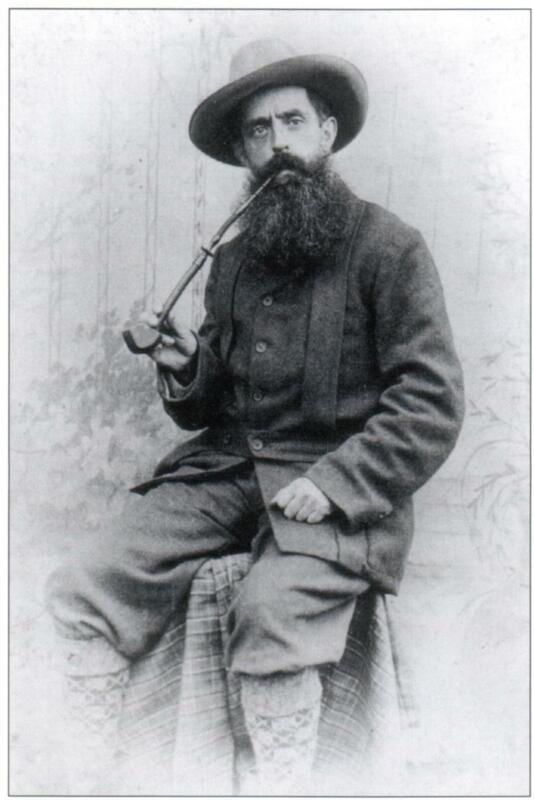 The image of the veteran photographer as an old gentleman with a very long beard was confirmed by Peter Kirby's father, Fred Kirby, who recalled that, in his latter years, Arthur Francis was "an old man with a long white beard that he used to tuck into the top of his trousers". Arthur Francis died in 1934, at the age of 78, in the Uckfield Union Workhouse. [ABOVE] The trade plate of Arthur Francis, Photographer of Nutley, near Uckfield, as shown on a cabinet card produced around 1895. Apparently, during the first two decades of the 20th century, a number of Arthur Francis's portraits of Nutley characters were issued in the picture post-card format. Anyone interested in the work of the photographer Arthur Francis and the history of Nutley should consult Forest Camera: A Portrait of Ashdown by Peter Kirby (Sweethaws Press, 1998). Peter Kirby's book contains 240 photographs, including scores of pictures of Nutley and portraits of the inhabitants of the village as they appeared in the late Victorian and Edwardian period. Peter Kirby has also provided some biographical details about Arthur Francis. I am also grateful to Peter Freeland who has kindly shared his uncle's reminiscences of Arthur Francis. Thanks to Mari Alderman, who has made a study of professional photographers in Wales and, using information taken from trade directories and other primary sources, has provided studio addresses and dates relating to the photographic activities of Arthur Francis and his father Charles W. L. Francis during their time in Abergavenny. Other sources includes census returns for the years 1861, 1871, 1881, 1901 and1911 and various trade directories, including Slater's Royal National Commercial Directory of North & South Wales (1880) and Kelly's Directory of Sussex (1890, 1895, 1899,1905,1907,1909,1911,1913,1915, 1918,1922 and 1924).